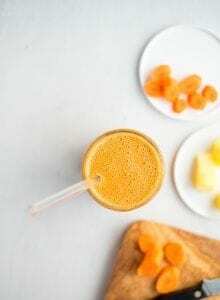 This vegan carrot smoothie tastes like carrot cake but is healthy enough to enjoy it anytime you want. This recipe is high in protein and fibre, low in fat, good for digestion, has anti-inflammatory and immune-boosting properties and besides that, it just tastes great! Add all ingredients to a blender and mix until smooth and creamy. Pour into a glass and enjoy. This is also amazing as a smoothie bowl. To make it, simply decrease the liquid to 1/2 cup and use the tamper of your blender to press the ingredients down, blending on low until you have a thick, ice cream-like consistency.